Miami huddled together on the field at the end of the third quarter. 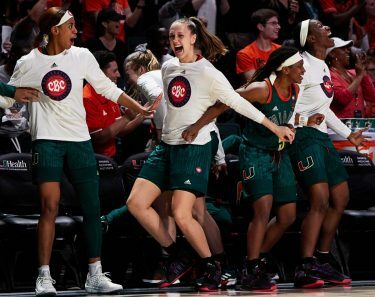 Holding an 11-point lead going into the final 15 minutes, the Hurricanes motioned their hands in the air to pump up the crowd of 63,932 fans who had been so electric all night. It was a sign for UM. 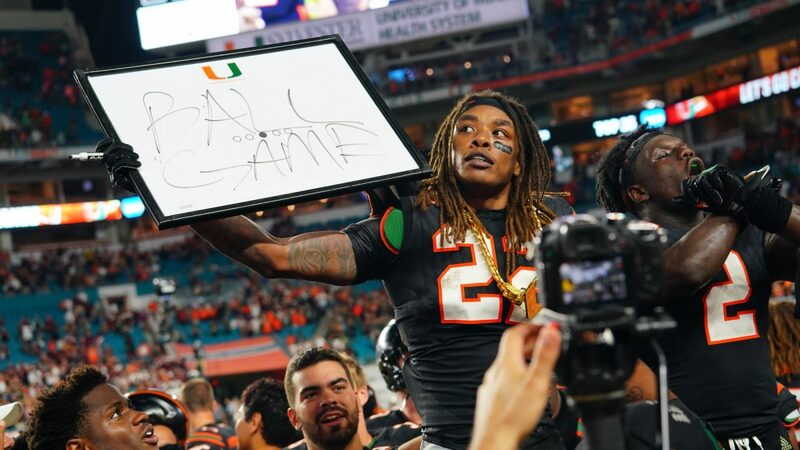 This was going to be the fourth quarter where it made a statement against one of the best teams in the country and prove to doubters that the Canes are a legitimate contender in college football. No. 10 Miami extended its lead in the fourth quarter off a 13-yard Malik Rosier touchdown rush, and the Hurricanes went on to defeat the No. 13 Virginia Tech Hokies 28-10 Saturday night at Hard Rock Stadium. 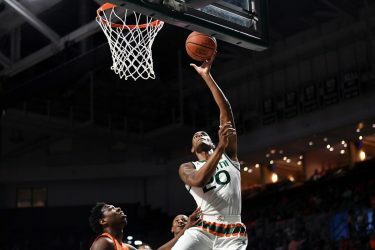 After winning their previous four games by a combined total of 18 points, the Canes (8-0, 6-0 ACC) finally got a win by double-digits in undoubtedly their best played game beginning to end this season. They controlled the momentum and pace throughout the entire contest. The Miami offense and defense were clicking at the same time – something head coach Mark Richt had been wanting for weeks. Rosier threw for just 193 yards but made both of the UM second-half touchdowns happen with either his arm or his legs. He racked up 84 yards and a touchdown on the ground on 13 carries, and his mobility in and out of the pocket was the key on offense. He finished throwing two touchdowns but also had three interceptions. Sophomore running back Travis Homer led the Canes on the ground with 95 yards rushing and a touchdown on 14 carries. The score came off a 64-yard cut-back run down the middle that gave the Hurricanes a 14-0 lead in the second quarter. Virginia Tech (7-2, 3-2 ACC) came into the game ranked No. 9 in the country in yards per game allowed, giving up just 285 yards of total offense a night. Miami racked up 429 total yards Saturday night. UM’s defense looked about as ferocious as it has all season, forcing four turnovers, eight tackles for loss and four sacks. It held Virginia Tech quarterback Josh Jackson – who had already thrown for more than 2,000 yards and 17 touchdowns on the season – to just 197 yards passing with two interceptions and no scores through the air. Miami now has 13-straight wins dating back to last season – the most in the FBS – and stays the frontrunner to win the Coastal Division. The Canes need just one more win or a conference loss by Virginia to clinch a spot in the ACC Championship game for the first time in their history. “The student section brought it, and the fans brought it,” defensive coordinator Manny Diaz said of the energy in the stadium. Next weekend, the University of Miami will be getting a visit from College GameDay, and the Hurricanes will stay at home in another primetime matchup – this time against the dangerous No. 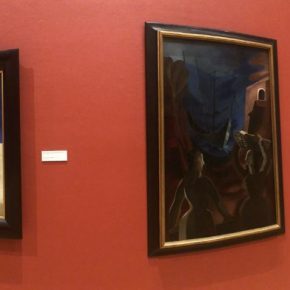 3 Notre Dame Fighting Irish. Kickoff is set for 8 p.m. Nov. 11 at Hard Rock Stadium. 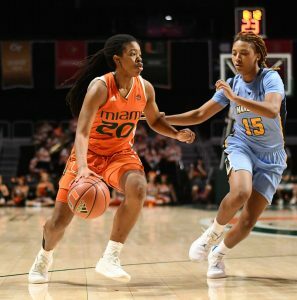 – For the third-straight game, Miami forced four turnovers by the opposing team. 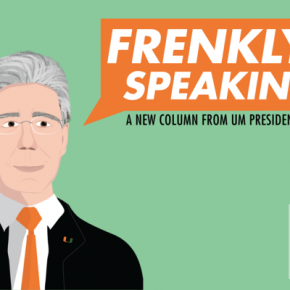 – UM’s defense was led by sophomore cornerback Malek Young, junior safety Jaquan Johnson and sophomore defensive end Joe Jackson. Young recorded seven total tackles, Johnson had seven total tackles, a one-handed interception and a forced fumble, and Jackson totaled two tackles for loss, two quarterback hurries and a sack. – Virginia Tech went just 3-14 on third downs. – Hurricanes tight end Christopher Herndon has scored a touchdown in three consecutive games. – Miami senior wide receiver Braxton Berrios caught three balls for 50 yards and a touchdown. His seven total touchdowns on the season leads the team. – The Canes will now be ranked in the AP top 10 for the fourth-straight week for the first time since 2005. – UM will be hosting Notre Dame for the first time since 1989.